Sharper Insights. Smarter Business. Your Chance to Drive Change. 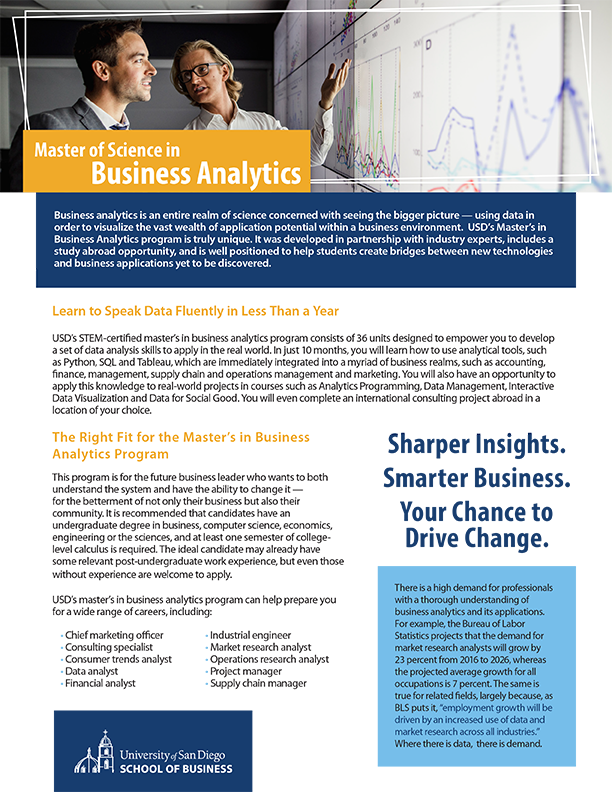 The STEM-certified master’s in business analytics program empowers you to use data to solve critical problems in the smartest way possible — whether that means helping a business run more efficiently, showing a municipal government how it can reduce its environmental waste or guiding a nonprofit such as the Red Cross toward new operations that broaden its impact. Through courses such as Data for Social Good, you will learn how to wield data to make a positive impact in society — a central focus of USD’s master’s in business analytics program. To solve complex problems, companies and organizations need individuals who know how to ask the right questions. USD’s master’s in business analytics equips you to be that person. Unlike other business analytics programs, USD insists on a holistic approach to your education. You will, of course, graduate with solid analytics skills, but you will also develop a better understanding of the soft skills required for problem-solving in the workplace, including communication, creativity and collaboration. The well-rounded and in-demand set of skills you gain in this program is applicable to a variety of career paths and aspirations, including those in the fields of marketing, accounting, finance, operations, education, government, nonprofits and beyond.